IceFire Fleece Pair of Skates Figure Skating Jacket - Clearance! Kinzie's Closet Home >> Ice Fire Fleece Pair of Skates Skating Jacket - Clearance! Ice Fire Fleece Pair of Skates Skating Jacket - Clearance! The IceFire Fleece Pair of Skates Figure Skating Jacket is crafted from high performance Polartec power stretch fabric to minimize moisture and chill while allowing you a full range of motion for ice skating competition warm up or everyday practice skating routine. 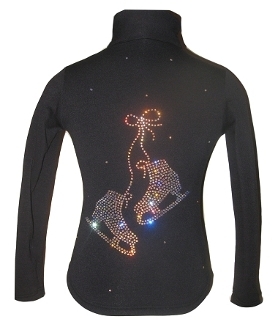 The back of this stylish ice skating jacket features a "Pair of Skates" rhinestones applique design, made from superior machine cut Czech Rhinestone crystals. Choose from several colors in Child XS - Adult L. Click on images to see crystal color choices. This is a clearance jacket. Brand new, but too many in stock. All sales are final, no returns or exchanges. Please know your size before ordering.